Adult Day Care is typically provided in a non-residential facility that supports the health, nutritional, social, and daily living needs of adults in a professionally staffed, group setting. The majority of centers provide meals, meaningful activities, and general supervision. 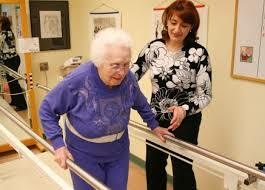 Home care or In-home care is supportive care that is provided in the home. Care may be provided by licensed healthcare professionals who provide medical treatment needs or by professional caregivers who provide daily assistance to ensure the activities of daily living (ADLs) are met. The largest segment of home care consists of licensed and unlicensed non-medical personnel, including caregivers. Care assistants may help the individual with daily tasks such as bathing, eating, cleaning the home, preparing meals, preparing meals and companionship. Non-medical home care is paid for by the individual or family. Skilled Nursing Care: Can only be done by licensed nurses. Examples include complex wound dressings, rehabilitation, tube feedings or rapidly changing health status. This includes accident victims or people who've developed or contracted a serious illness. Stroke victims often require rehabilitation and must learn how to talk, walk or feed themselves all over again. Skilled nursing facilities, oftentimes referred to as nursing homes, are facilities where patients can receive skilled nursing services 24 hours a day. Medicare will pay for skilled nursing facility services if a physician has deemed that a patient requires skilled nursing care and the services will help patients meet their health goals. Hospice Care focuses on the seriously ill, chronically ill or terminally ill patient's pain and symptoms, and attending to their emotional and spiritual needs. The modern concept of hospice includes care for the incurably ill given in hospitals or nursing homes but also care provided to those who would rather spend their last months and days of life in their own homes. Respite care is planned or emergency temporary care provided to caregivers of an adult or child. Respite programs provide planned short-term and time-limited breaks for families and other care givers in order to support and maintain the primary care giving relationship. Even though many families take great joy in providing care to their loved ones so that they can remain at home, the physical, emotional and financial consequences for the family caregiver can be overwhelming without some support, such as respite. Respite provides a break for the family caregiver, which may prove beneficial to the health of the caregiver. Graceful Senior Solutions partners with several outstanding home care, skilled care and hospice care and adult day care and respite providers throughout the area.